It’s been a couple of months since we announced the opening of the Whitehead Research Library, and about four months since the last general Critical Edition update. We are approaching the end of the scanning process for the newly discovered Whitehead papers. In order to scan them more quickly, we have been doing minimal cataloging, waiting until the physical scanning is completed before we examine everything more closely. So far we have scanned about four hundred items. Aside from some unpublished essays that we made available on the WRL, the majority of the papers are letters (mostly of a personal nature), copies of Whitehead’s own published articles, or articles by others about Whitehead (by such people as Dorothy Emmet, Paul Weiss, Edwin Burtt, and Greg Vlastos), and other miscellaneous documents ranging from Eric’s old French primer to a handwritten list of luggage for the Whiteheads’ voyage across the Atlantic. Much of it is more of personal/biographical interest than it is of academic value, but there are certainly exceptions. One example, for instance, is multiple copies of a 1924 syllabus entitled “Syllabus for an honours course for graduates in the faculty of science leading to a second B.Sc. 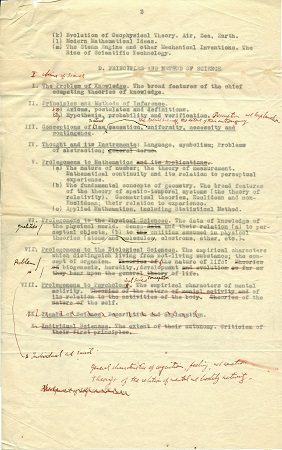 degree,” one with Whitehead’s handwritten emendations (the third page of which appears at the top of this post). It will still be quite some time before we can fully catalog and process all of the items, but we hope to finish the scanning in just a few more weeks, then make a few of the more interesting finds publicly available. As for the editorial work on the second volume of the Critical Edition, which will cover student notes for the 1925-26 and 1926-27 academic years, we have completed an initial draft of the first year worth of notes (and sixteen lectures in the second year). For those interested in stats, the Harvard lectures for this initial draft are a total of 35,000 words, to which we have added about 22,500 words worth of footnotes (634 total notes). Some of these notes are explanatory, but many are text from alternative sets of student notes that we have supplied at the appropriate places, text which either expands or clarifies the notes in our chosen primary account. We are hopeful that all of this will help make this volume the best resource that it can be for Whitehead scholars. 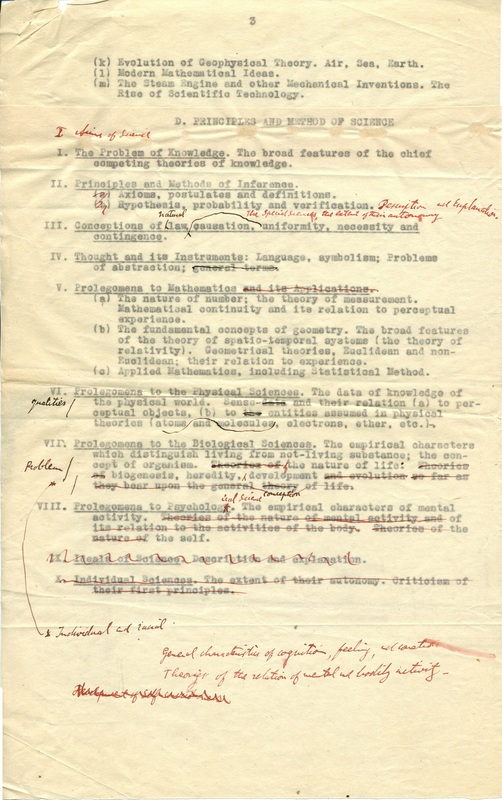 We are also nearing submission on an anthology of essays which explores the significance of the first volume of the Critical Edition, entitled Whitehead at Harvard, 1924-25. It is based on the papers delivered at the 2017 WRP conference, along with a number of other invited papers. We’ll have more on that after the book is submitted and we approach publication.